Percussion Instruments List | Gear Acquisition Syndrome!! … there has been music. Nuts in an animal skin; bones against a cave wall; seeds shaken in a gourd… the sounds of percussion have been our rudiment soundtrack since time immemorial. 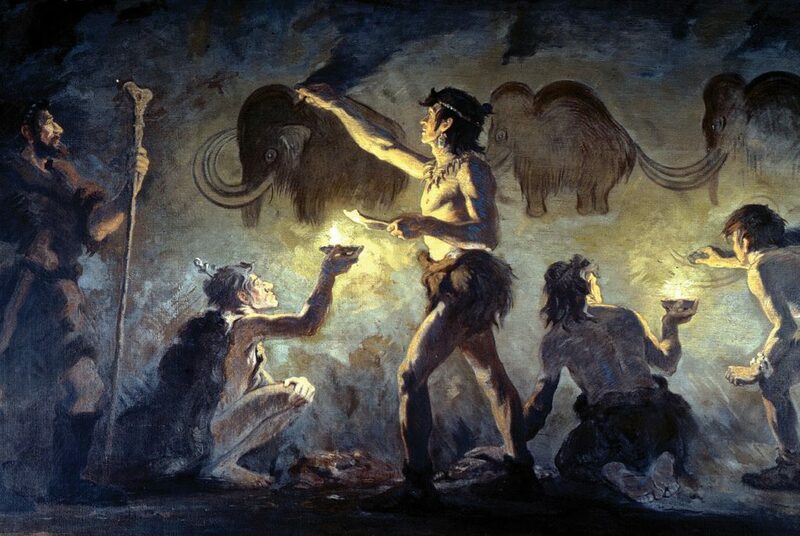 Was it the first Arctic humans, hunting huge woolly mammoths that first discovered the inherent musical qualities of hitting something?? Or perhaps their cousins down in Africa, throwing spears from trees at wildebeests, first began to relive hunting successes by the sound of striking things?? 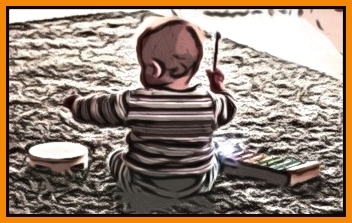 Whatever the case, today’s percussion instruments list traces its lineage all the way back to those forefathers, and there’s something in us, even as babies, that wants to bang out some sounds just like they did!! Because talking about sound is about as inane as smelling a famous painting, let’s take a moment to introduce each of the instruments we’ll be going over today. It showcases seven of my favorites. I go to these time and again to add ear candy and groovalicious accents to the tunes I record in my studio. 1) Hey, Mr. Tambourine Man! First up is the tambourine. This awesome instrument is definitely one of my favorites. I use it A LOT, and it always adds that extra ZAP of energy that I need for a certain song section. The tambourine has a long, rich history. Old Testament passages in the Bible talk of King David playing one, so it’s at least thousands of years old. Who knows what the first ones were made from, but they were obviously just as popular back then as today. Arguably the best rock band of the past century, The Beatles, used its jingly electricity every chance they could. In fact, you can’t listen to a Beatles album that doesn’t happen tambourine. And then, of course, there were the Monkees. Taking a cue from our favorite British moptops, they raised tambourine use to whole new levels, mostly thanks to that god of teen girl eye candy, Davy Jones. My favorite way to use this instrument is adding it to the chorus of a song, to give it that extra bit of lift to set it apart, and raise its excitement level to the brim. 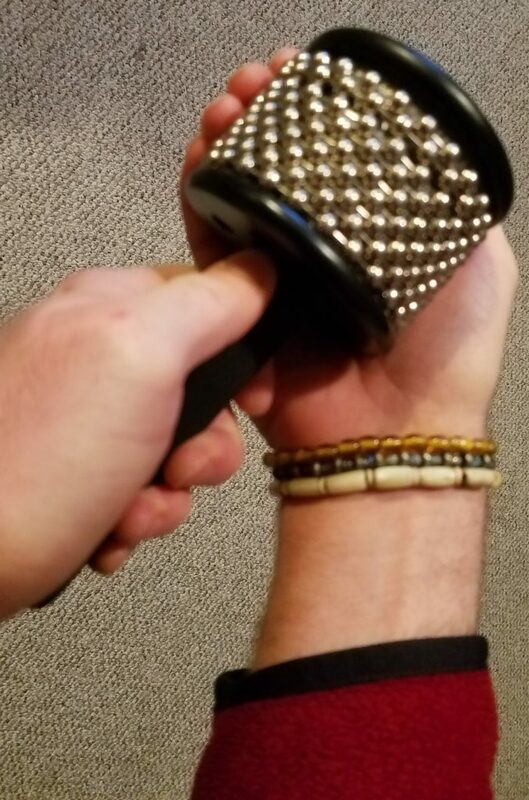 In any section of your song that you want it to become more “driving” and compelling rhythmically, a tambourine is the answer to your prayers. Or add a medium to large reverb to its signal, Pan it to one side or the other, use it for accents. This is really one of those “can’t go wrong” instruments. Unless you’re just really bad rhythmically, the tambourine will probably add some serious sparkle to your music. Try it out! You’ll love it!! 2) These Ship Pegs ROCK! One of my other favorite is the claves (pronounced “Klah – Vaze”). They’re basically two thick sticks about the size of hot dogs (without the bun!). When you hit them together they give a sharp, crisp, “cut through the mix” smack that almost rivals a snare drum. They’re used a lot in Cuban, Puerto Rican, and African music. Their origin is Cuban. Spanish slaves building ships there noticed that the “Cuban Hardwood” pegs that they were using to build ships (instead of metal nails which were too expensive) made quite an impressive, sharp, inspiring sound. Soon they were using them to complement the music they played, which was derived in large part from their African heritage, and the rhythms and melodies they remembered from the time before they were captured and sold as slaves. The rest… is music history! Claves are great to use if you want to accentuate a rhythmic backbone of some kind. 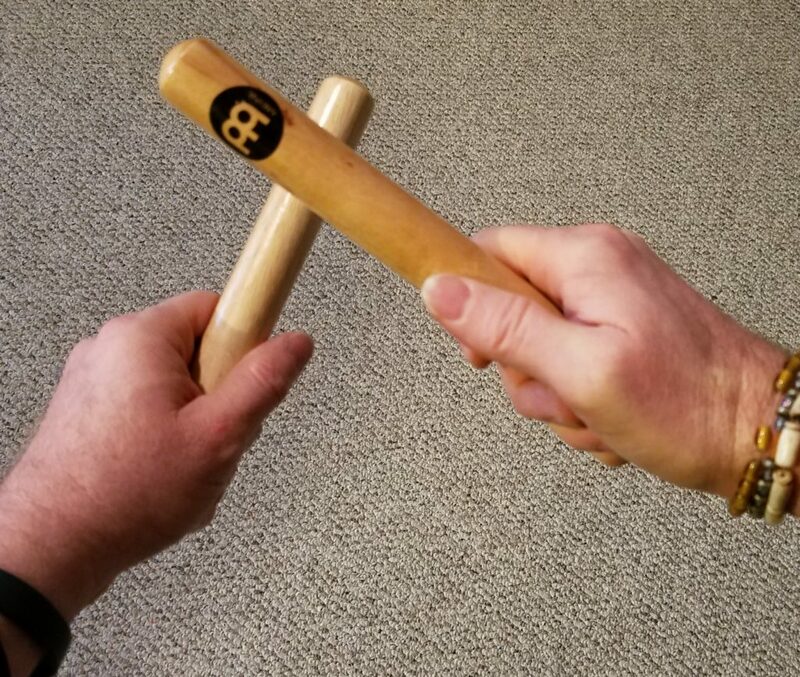 If you’re doing a complex Latin rhythm that will have a lot of soloing and/or rhythmic improvisation over it, the claves will help keep the beat defined behind it all. 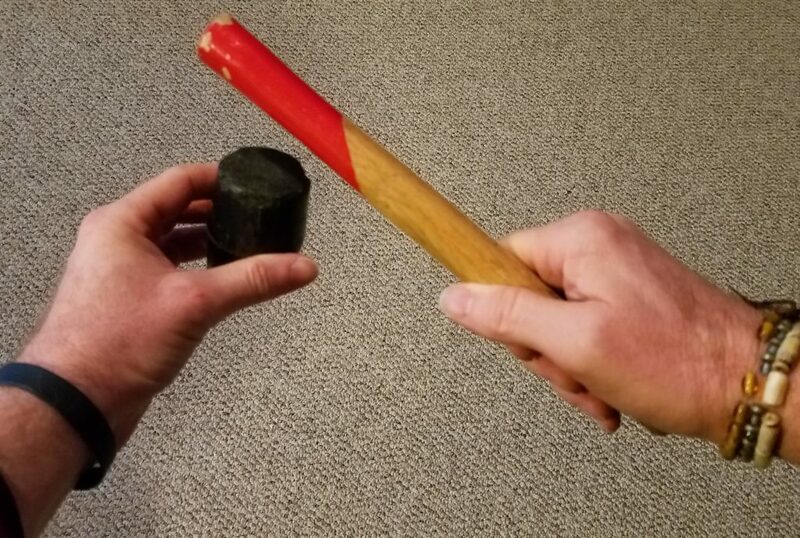 Totally by accident, I’ve also discovered that if you take the head off of a regular hammering mallet that you can get at any hardware store, it actually sounds very much like a Clave strike, only lower in pitch, when you hit the head with the handle. This is great, because now I have TWO different Clave sounds to add to my tracks instead of one. Whodduh thunk?!! I’ve also at times doubled my snare drum hits with clave strikes. It adds a high-frequency sting that is just right for certain songs. Bottom line? If you like to hit things, then you’ve gotta get a pair of claves. Just don’t be surprised if a woman with sultry eyes & a rose in her teeth starts dancing around you. 3) Shake, Shake, Shake,Señora… ! If you’ve ever recorded any kind of ballad, then you probably know how awesome shakers can be. In those moments where you can’t really bring a drum kit in because it would be too ostentatious, but you still need something to help keep the beat behind mellow instrumentation, the shaker is an indispensable tool. My favorite shaker you see to the right, by Rhythm Tech. I like it because you can get TWO sounds out of it. First, if you hold it like the picture above, you get a soft, gentle, airy kind of sweep that is subtle and mesmerizing. But if you hold it lengthwise, like in the picture to the left, you get a much sharper, cutting accent that is perfect for medium-tempo songs, parts of a ballad that start to drive a little more. There are many other types of shakers too. If I’m not using the Rhythm Tech shaker, then you’re probably going to find me with eggs in my hand. Each egg has a different EQ frequency spectrum, so having a good selection allows me to pick just the right one, or two, that will complement the song without getting in the way. They even make eggs with handles! 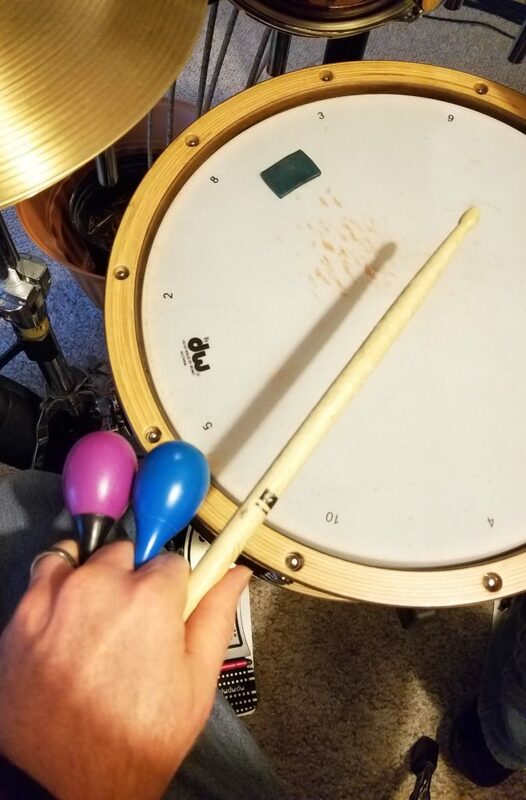 I find these great to hold in the fingers of my snare hand, so that when I hit the snare you also hear the more subtle sweep of the sand inside the egg. Pretty cool effect, though certainly not one I would overuse. You can’t go wrong trying a shaker on a song if you think it needs a subtle groove, but you know that drums would be too overbearing. 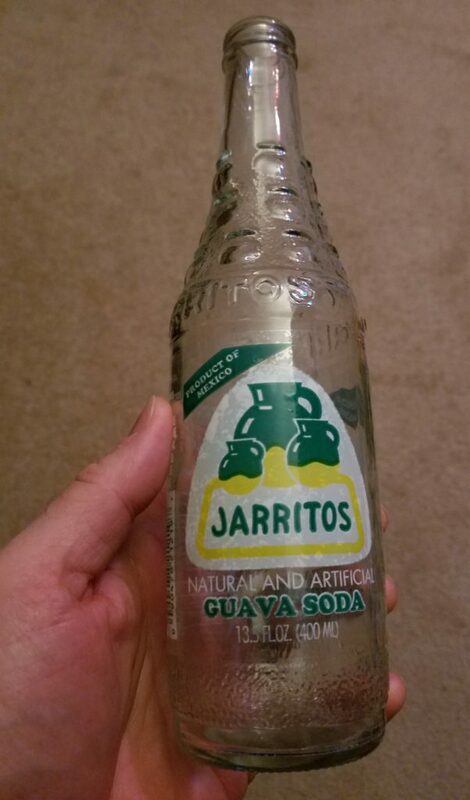 I happened to see in the “foreign foods” section of a grocery store one day: a bottle of Jarritos Guava soda! I decided I must try it. Here in the States, Guava ANYTHING is not seen very often. At least not in Detroit! After I’d polished all the jamming ‘ juice off, I did what I always do when I have an empty bottle – I tapped it to see what kind of a sound it makes! This might be a percussion player/drummer thing, but I’m frequently tapping things to see what kind of sounds they make. It often yields some pleasant surprises… things that wind up on at least one of my recordings! This guava pop bottle was no exception. As soon as I tapped it, I knew the “TING” it produced was different than any bottle I’d experienced before. It sounded very… musical. I remember this occured during the recording of my first album, so I immediately decided to use it on a song I had nearly finished. I put it in the Chorus sections of the tune, basically as a snare drum hit on 2 and 4. Underneath were acoustic guitar, a bed of “Oooooo” background vocals, my lead vocal and a shaker (my RhythmTech!) to drive the beat. It worked great! To this day whenever I hear it I smile, knowing that most people will betrying to place whatthat sound IS when they listen. Found objects make great percussion instruments. Anything can be music! 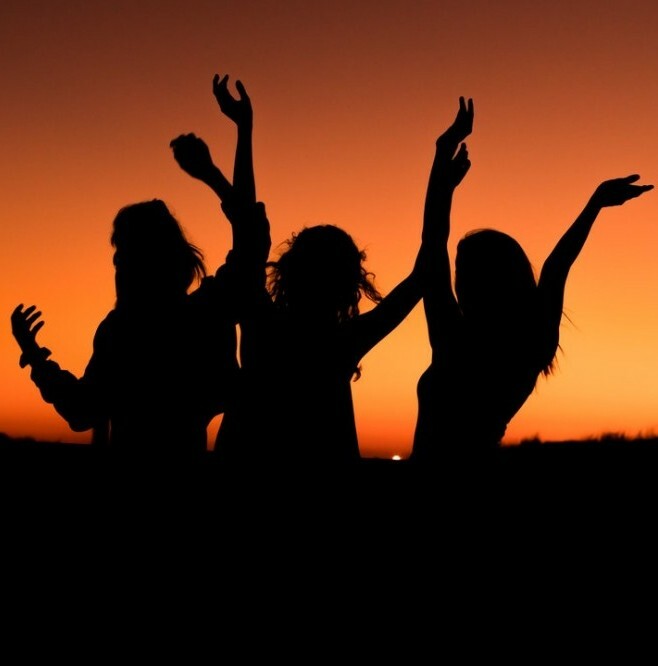 After all, if people take the time to listen to our music… why not make it interesting?! The TRIANGLE is a percussion tool that I use sparingly, but is always a welcome element of a mix when the groove allows its unique properties to shine! 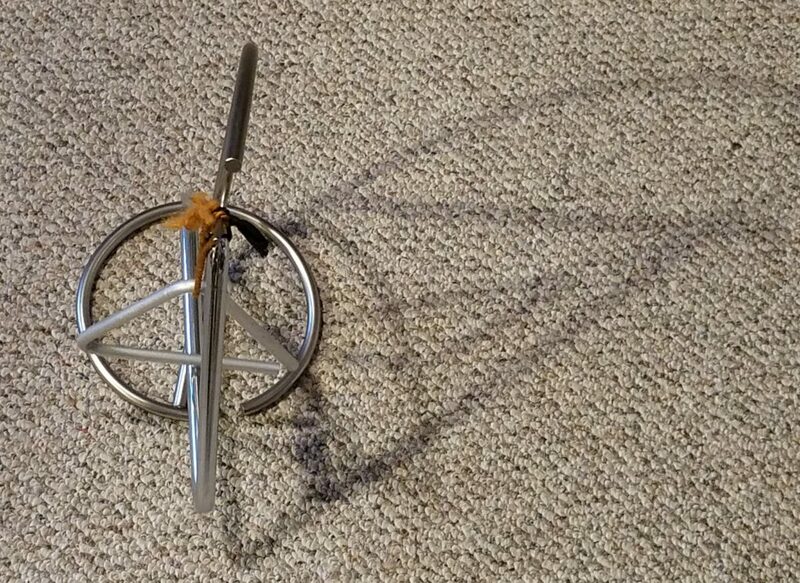 Here’s a tip for playing the triangles that I discovered years ago: Instead of laying them down on a surface until you play them, hang them on a BANANA HANGER! 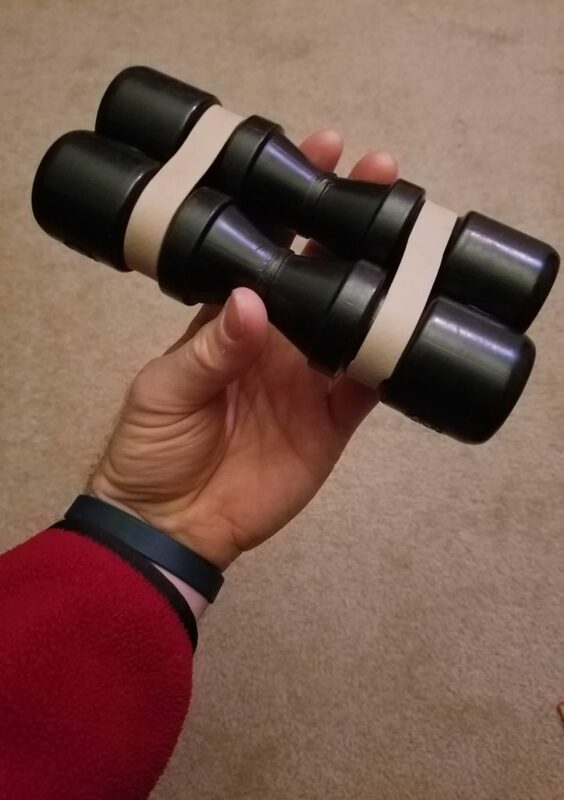 I find it to be the perfect way to keep them at the ready during a performance. You can, in fact, play them ON the banana hanger, then move on to your other tools. Quite convenient – especially if you’re playing back and forth on many percussive instruments during a show. Remember that playing the triangle while TOUCHING it will produce a staccato sound, but hitting it when it’s hanging free will allow it to sustain. Using both these methods, back and forth, can create some very entrancing tracks. The CABASA is a familiar instrument to all percussionists who play Latin music. It’s perfect for high-frequency rhythmic accents that sit well above the vocals and other instruments, helping to make the beat interesting without being ostentatious or in the way. It only has about two useful sounds, but both of them can be just the ticket for the right kind of song. I typically don’t have the cabasa that high in the mix when I use it. That’s mostly because I don’t do Latin-style music typically, and this has an immediate “flavor” of that genre. Putting it subtly behind a drum and bass groove though can really make the beat more interesting, especially if you throw in some off beats against a more straight groove. As always, just put up a mic and PLAY. You’ll find what works if you just relax and have fun with it. Think of yourself playin’ on a beach in the Caribbean, with a roaring bonfire, hundreds of dancing guests and surfers, and a kickin‘ band all around you. You might not have guessed that the Glockenspiel is a percussion instrument, but it is. Because you typically hit it with mallets, it’s always been found within the percussion family. I love, love, LOVE to use the glockenspiel on songs. It adds such brightness, such joy, such a sparkle and shimmer to any melody. I can’t imagine my studio without it, and I have used it on dozens of recordings. Yes, if you buy any synthesizer, there will be a glockenspiel sound in it. What that will NOT give you, however, is the mixing of the frequencies and overtones in the air that happens when you play one live. If you put a microphone on a real glockenspiel and record it, then play the same thing on a synthesizer, you’ll see what I mean. They’re not even in the same league! The Glock will sound different depending on the hardness of the mallet you strike it with. I have a large range of mallets, from plastic to brass, that help me tap out many tonal variations from those little steel bars. My favorite secret trick with the glockenspiel? Doubling melodies!! Man, does this work well. These can be vocal melodies, but they don’t necessarily have to be. On a lot of songs, I have polyphonic melodies behind the vocals, maybe done by a guitar, or a piano, or a trumpet, or a saxophone. 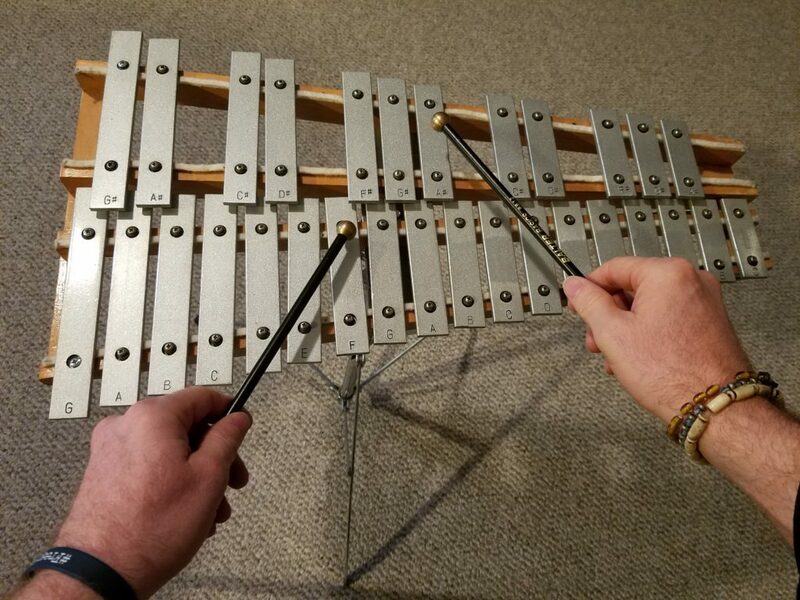 Regardless of what you’re doubling, the Glockenspiel will add a high frequency glistening quality to whatever you choose. Each note you strike will be like bright, tinkly happiness spread across your musical toast. What a way to wake up the world to your songs!! It’s thanks to our smaller percussion items that we have huge drum kits today. We wouldn’t have found one without the other. Regardless of to whom the honor belongs though, percussion has stayed with us for tens of thousands of years, consistently being the heartbeat and backbone of all that gets us shakin’ our money maker! I have used the percussion instruments listed above literally hundreds of times. With each use, I escalated the “dance-worthy rating” of my songs to new heights, and intensified their “booty-shakin’ quotient” with a soul-stirring pulse of life. 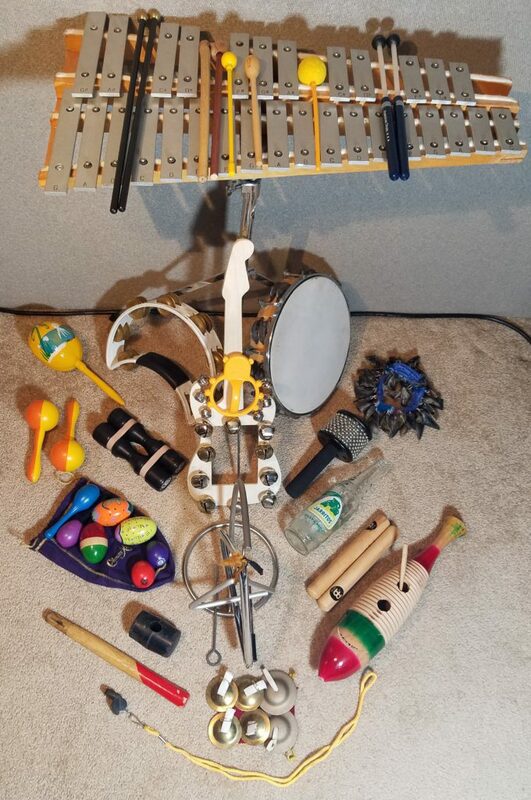 There you have it – my percussion instruments list. Maybe you’ve used ’em; maybe you haven’t. Either way, I hope you’ll try ’em out and utilize them in your own recordings. 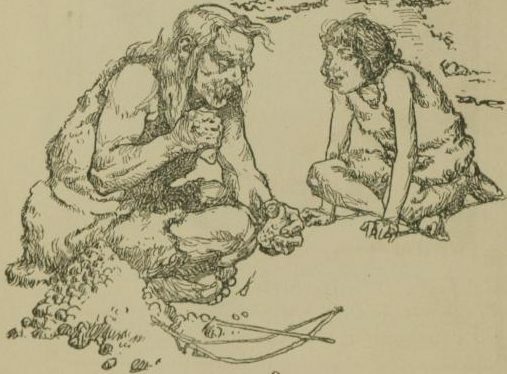 You’re sure to find that they spice up your aural landscapes in new and delicious ways, such that any Neanderthal man would stand up and start partying! Remember, too, that any thing you can hit, can be percussion. There are literally hundreds of sounds awaiting you, right at your fingertips everyday, that might be perfect for your song. Everything truly IS music! If you’re curious what these percussive instruments sound like in a final mix, check out the last album I produced in my studio for lots of examples: the “Tempus” album by “Sweda“. Make sure to listen to it with a good pair of headphones (like THESE PAIRS) so that you can hear the intricate and complex vertical & horizontal placement of the percussion in the mixes. We spend a lot of time getting the percussive beat candy just right!! If you’ve already used percussion a lot, or even if you are a newbie but decided to give it a shot and do some recordings, let us know. Leave us your thoughts in the comments section, or better yet… A link to your recordings showcasing YOUR favorite percussive groove. Now, go… make… (percussive) sounds!! That bottle was used on my first album, which is no longer in print. Throw me your email though, and I’ll send you the song personally. It’s very easy to pick out in the mix what the bottle is… it just has that unique sound!! Wow, LearnToEarn… I can tell you’re into music as much as WE are!! Awesome!! Okay, you’ve got to dish on these flutes… Do you have a website link where we can see them?? I like to play Irish Penny Whistle, which is not too far off from what you make. You should check them out, Fortune. Surprise your drum circle friends next time there’s a community jam with playing, say, a pair of Claves! They’ll be wanting to get their own in no time, I bet ya! Yea, most of these instruments have probably been played by man for thousands of years. Pretty cool, when you think about it. How/where do you play music these days?? Great to see you again on our site, Rasa! 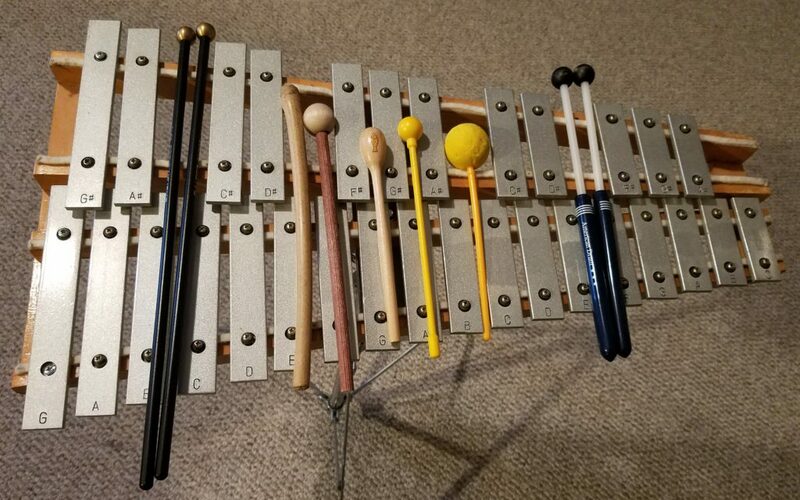 If you like the high frequency magical qualities of the Glockenspiel, you should try THIS INSTRUMENT next. Ever played one??! Amazing list! You probably won’t believe it but my father has most of these. He’s like the local guru of musical instruments for us. I myself also do enjoy all that is percussion instruments related. I did study drums and Glockenspiel back in the music school days! I really enjoy the sounds of them. Glockenspiel might even be my absolute favorite instrument. And I absolutely agree that it adds so much brightness to any tune. So, much playfulness and joy. In that sense, I’m definitely on the same page with you, I also can’t imagine a studio without those. Have a Wonderful Day, Teaj! Thanks, Mariah. So good to have you on our site. I’m a huge fan of girls who play guitar and sing. Way to go!!! Do you have any vidz of your material up on YouTube or elsewhere?? Check out our SeriousGas YouTube channel for a lot of stuff to learn, not only about percussion. There’s a lot about guitar playing and guitar gear there too. I do it all, Dave! Though I still love to call over my other musician friends and have them play on my tracks. If I need an instrumental part though, and no one’s available, I just do it myself. 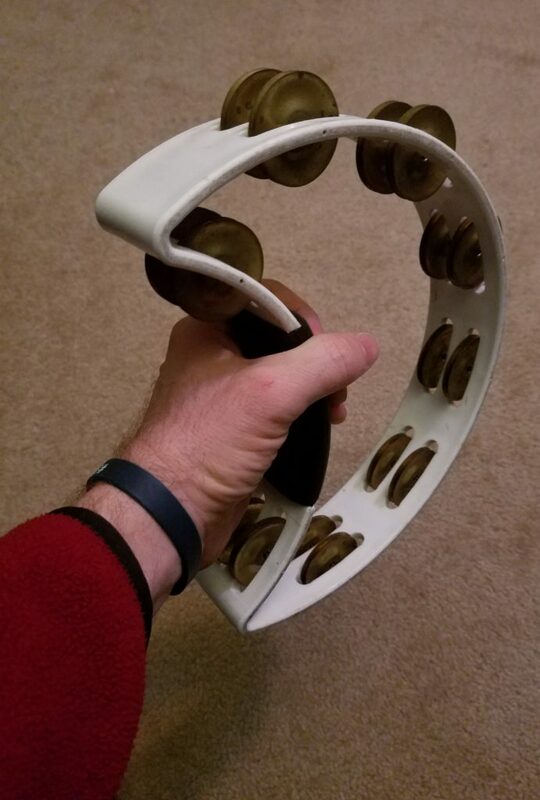 Hi,My grandma used to have a tambourine back in the days. She was part of her church choir. I never knew this piece of instrument was used by some of the biggest rock bands in history. What I love about the tambourine is that it doesn’t require any complicated skill in order to use it. Also, no special posture is required or finger placement. When used by some choirs, it sends the song to a whole new height, creating more excitement in the air. I can see that you are very creative with selecting instruments as well as adapting whatever you see around to produce a sound that suits it’s purpose. I’m really intrigued how you came up with the idea to use an empty guava bottle to produce an awesome and unique sound for your recording. Do you mind telling me what songs in your album has this TING sound? I would love to listen to them and see if I can figure out what part of the song has the bottle sound. I love your review on the percussion instruments. This is an area of interest to me as I am instrumentalist. I play keyboard and guitar but yet the musical instrumentation won’t be complete without percussion instruments. In this part of the world in Africa, we are used to Tambourine and drum roll. Sometimes with only Tambourine and drum roll we sing and enjoy our music. I am not use to other percussion instruments probably because they are not really used in this part of the world but I am happy to know about them. Thanks for the review. Music has been a huge part of life, since time unthinkable. And the importance of musical instruments in music, is obviously indispensable. Yeah, tambourines were featured alot in Old Testament music. Mariam, Jephthah’s daughter, David and others, were tambourine players. And they add alot of hype to song choruses. I personally look out for them, in choruses. Now, that’s a superb musical hack you have there. Hammering mallet and handle, as clave replacement or accompaniment, is brilliant! glockenspiel looks a lot like xylophones. But the xylophones I know are usually made of wood. I must tell you, they make heavenly sounds. Hey, I just wanted to leave a quick comment that I found your article very intriguing. I am a musician myself, I mostly sing and play the guitar, but just like the ancient people you speak of at the start of your article I have often found myself tapping out rhythms on basically anything near me. Tables, glasses, keys, you name it. I don’t know what it is but there’s something satisfying about doing it. I loved the video as well. I didn’t have time to watch it all but from the first little bit, I learned more about tambourines than I’ve ever known before. I always kind of thought they were silly, kid instruments. But now I know that I was sure wrong about that! I like the one with the skin that you showed. I think it’s super cool that you can change the tone by pressing on it, as well as play it like a drum. I’ve gotta run right now, but you can bet I’ll be back to finish watching the whole thing! 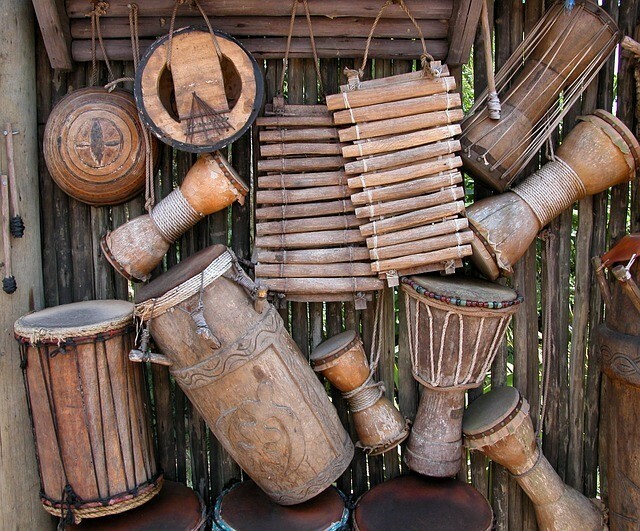 That is some great information on these percussion instruments. I never realized that there were so many different percussion possibilities! Then again, I guess there are a lot of things that you can hit with other things to make a sound! I am a guitar person myself, but realize how critical the percussion is in any song.Do you play the drums or just record, or do you do it all?